How do you keep a blog interesting when you are working on a boring sweater, that seems to go on interminably, and you don’t even like. 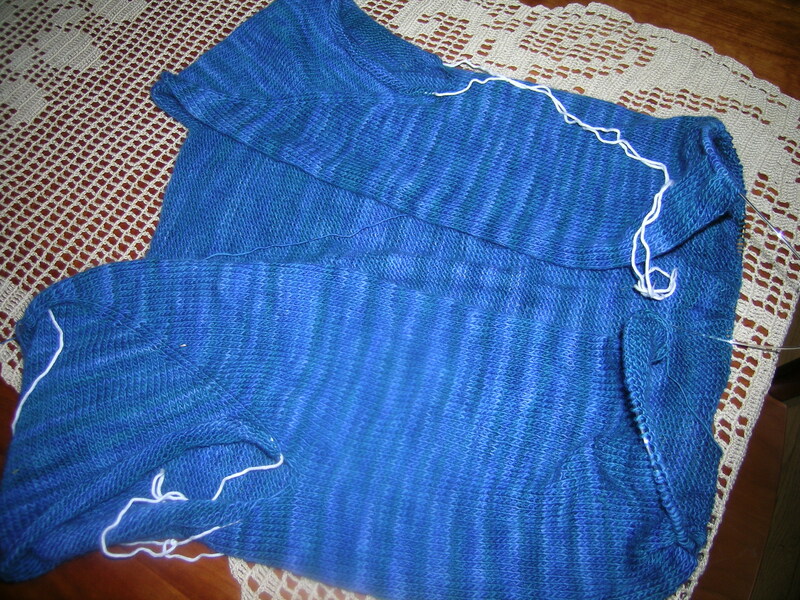 I am still working on my Featherweight Sweater. I keep kicking myself for purchasing this pattern. Word to the wise, just pick out a standard raglan sleeve sweater and do a gauge swatch with lace yarn on a larger needle (I used a size 7) and go. The concept of a very light sweater with lace yarn is great, just don’t waste money on purchasing a pattern, and be prepared for lots and lots of stockinette. (Photo taken on top of a lovely table runner that my mother crocheted for me). I am making this with Malabrigo lace, so went to Ravelry to see comments on the sweater. I looked at reviews of Malabrigo lace, and saw lots of negativity. Yes it sticks a bit, but not to the extent that was written about. I had to write my own personal review, as it seems that only the complainers write. That led me to look at the reviews for Baby Ull by Dale of Norway. This is my favorite baby yarn, and I love to use it for mittens. It is really a workhorse, and washes well. So, I was very surprised to see reviews about how it felted. I am not sure that you could felt this yarn if you tried, let alone just by working with it. So, again I wrote a glowing review, and this got me to thinking about what makes a wool superwash. I must admit that I really only use superwash for socks, baby items and mittens. For a sweater, I want as natural of fibers as I can get. Superwash wool is a special wool product that has been treated or processed in a way that allows it to be machine washable. Many people are afraid to work with wool because it is so easy to shrink (though some of us shrink wool on purpose) and superwash wool can allow them to work with great fibers without worry. Superwash wool is a wonderful choice if you like natural fibers but are giving something as a gift and don’t want to burden the recipient with a garment they have to handwash. So how is superwash wool made? It can be made using an acid bath that removes the “scales” from the fiber, or it can be made by coating the fiber with a polymer that basically keeps the scales from being able to join together and cause shrinkage. You probably won’t know which method was used on your superwash wool when you buy it in the store, but you might be able to tell when you start knitting. That’s because polymer-coated yarn tends to be slicker than regular wool. To care for superwash wool, wash it on the gentle cycle in your washing machine. A natural-fiber shampoo like you might use for hand-washing non-superwash wools is recommended. Let the garment air dry rather than using the dryer.